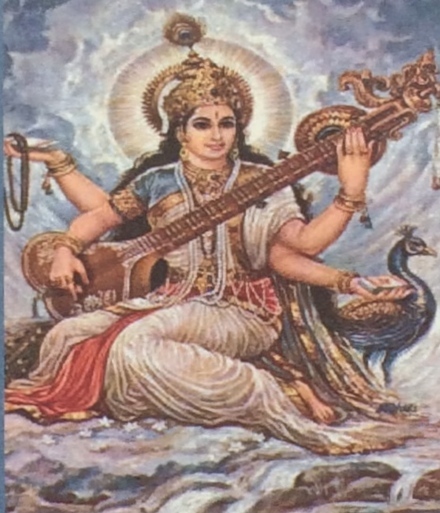 I have long been fascinated by the lute playing goddess, Saraswati. Saraswati is the Hindu goddess of learning, music, arts, and wisdom and for all these reasons strikes a chord in my being. And so, when I was in India and I read that there was a temple at the Ellora Caves with an important carving of a Buddhist version of Saraswati, I was thrilled and eager to see it. Little did I know that it would lead me to the oldest known statue of Tara, the goddess of compassion. The Ellora caves are a a few hours from Mumbai, and are a complex of temples and monasteries dating from 600 – 1000 CE. On the Unesco World Heritage website it says, “not only is the Ellora complex a unique artistic creation and a technological exploit but, with its sanctuaries devoted to Buddhism, Hinduism and Jainism, it illustrates the spirit of tolerance that was characteristic of ancient India”. Wandering through the 34 different caves -12 Buddhist, 17 Hindu and 5 Jain- one not only feels a sense of tolerance, but also such deep influence and sharing of ideas. 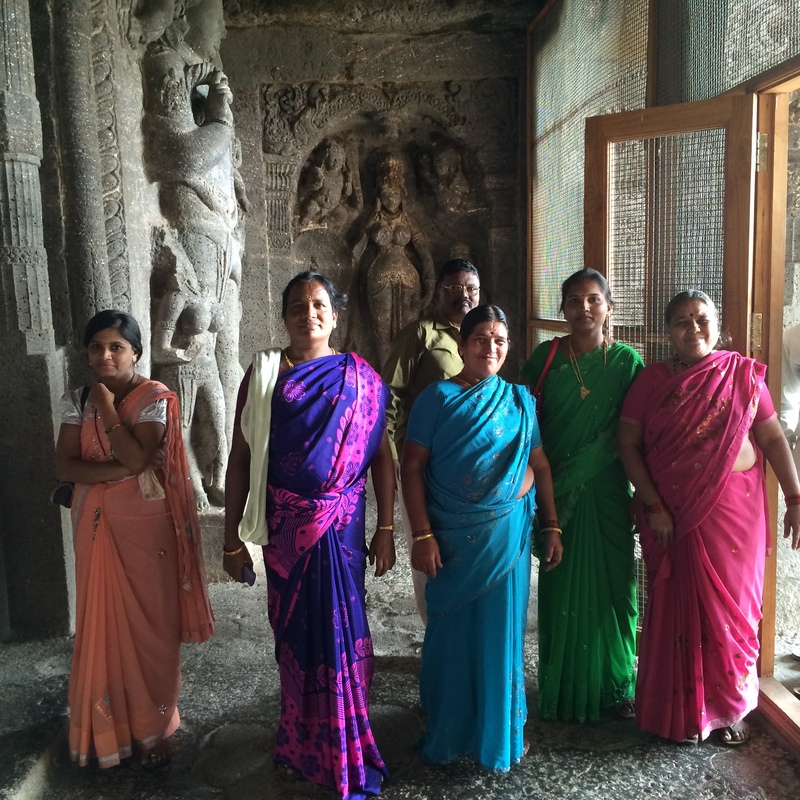 The cave temples at Ellora are mesmerizing. I have never in my life seen something that seems so humanly impossible -like the dry stone walls of Machu Picchu, the Pyramids in Egypt and the Coliseum in Rome. But unlike these sites where rock has been carved and relocated, all the cave temples at Ellora are carved directly out of the rock – the rock has been taken away to reveal these exquisite, intricate, ridiculously detailed monasteries, temples, obelisks, elephants and endless representations of Buddha, Siva, Parvati, Bramha, Vishnu, Ganesh, Tara and other deities. While hanging out in Pune, and researching the Ellora caves in the Lonely Planet guide on India, I read that the Buddhist Cave 6 contained a statue of the Buddhist goddess of learning looking very similar to Saraswati. Who was this goddess? And why in thirty years of practicing and studying Buddhism had I not heard of such a deity? What would she look like? As I used my limited internet on my phone, I could not even find anything about her. 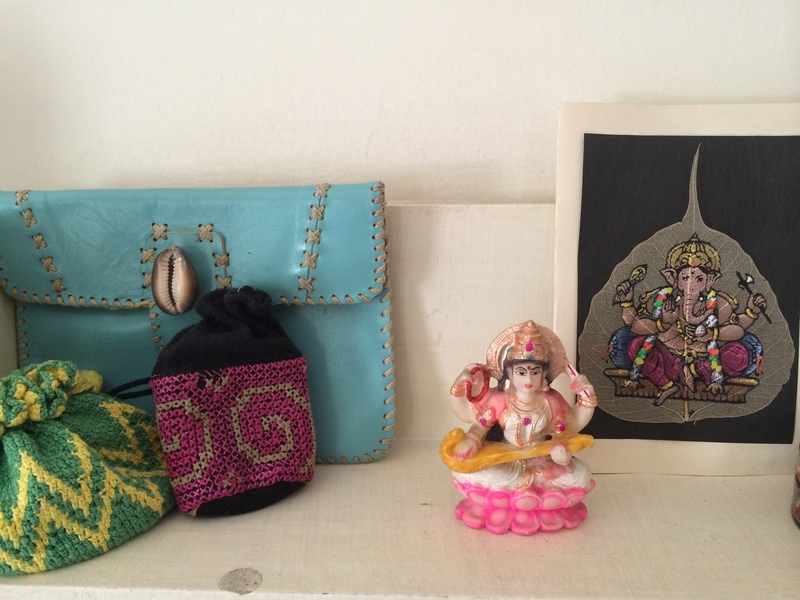 I looked at the little statue I bought of the Hindu Saraswati. She is dressed in white and sits on a lotus – symbolizing knowledge and truth. In her fours hands she holds items with symbolic meaning — a book, a mala, a water pot and a lute. The book she holds symbolizes the Vedas representing universal knowledge and learning. A mala of crystals represents the power of meditation and inner reflection. A pot of water represents the power to purify the right from wrong, truth from ignorance. The musical instrument, typically a veena, represents creative arts and harmony, the love for and rhythm of music, and all emotions and feelings expressed through it. I thought of how music, particularly playing piano, has been a deep and spiritual journey for me. 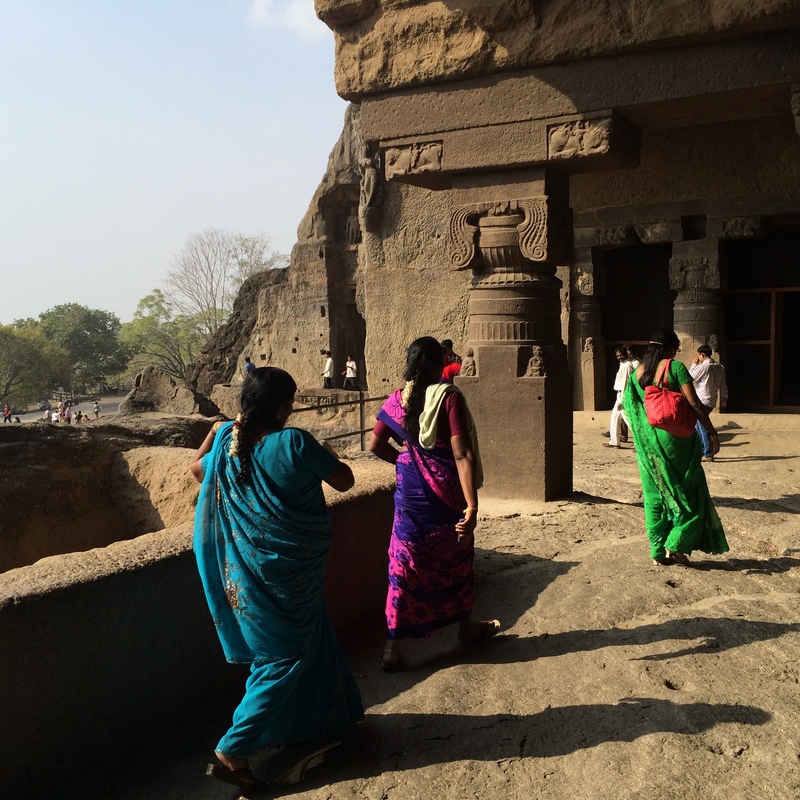 At the end of my time in India, I was finally going on a two day pilgrimage to visit the caves. 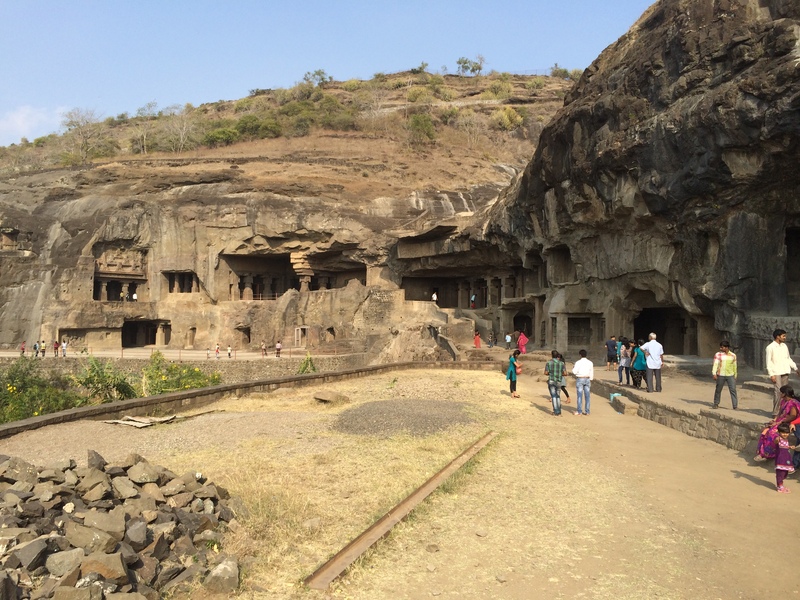 Our trip began at the Caves of Ajanta. The caves there are all Buddhist, dating from 200 BCE – 600 CE and are totally incredible. 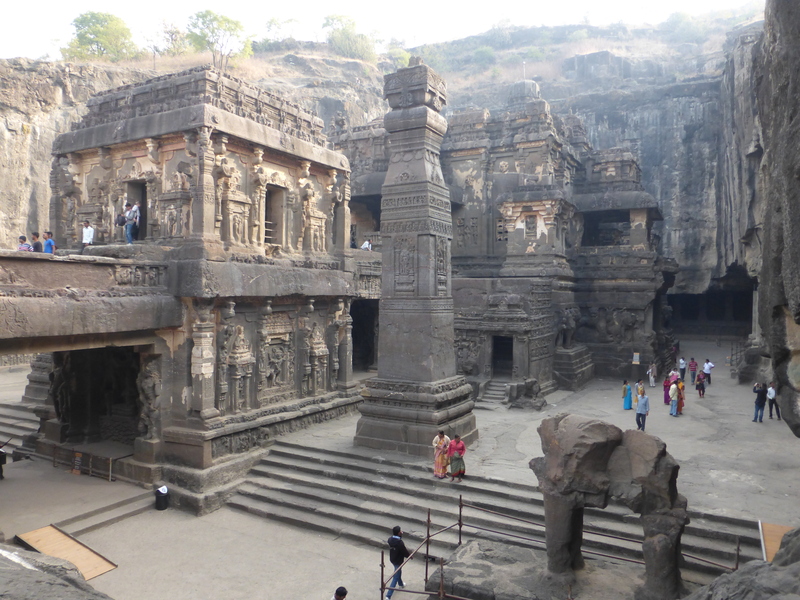 What is so fascinating is that the Ellora Caves appear to be a continuation what began at Ajanta. 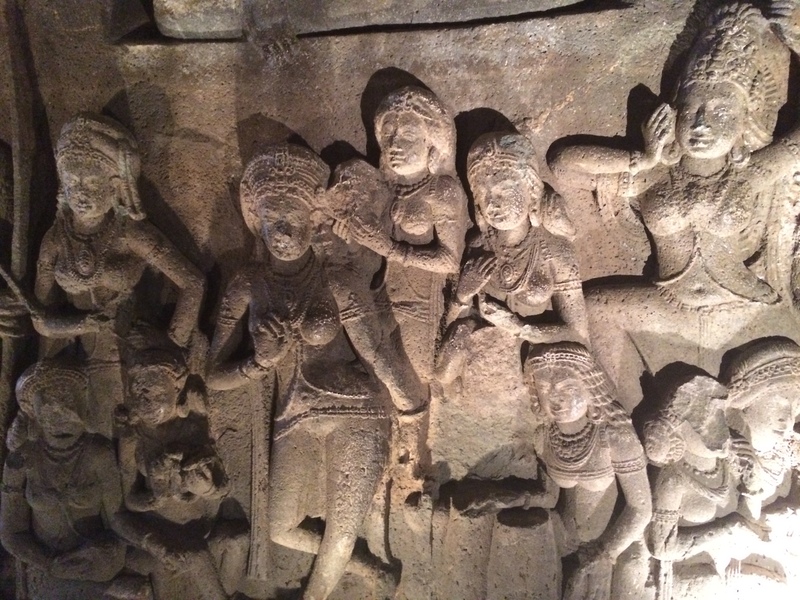 It is as if the inhabitants of Ajanta picked up and moved to Ellora right around 600 CE. I imagine this valley a home to these devoted Buddhist practitioners who are then joined with the Hindu practitioners, living there together, harmoniously for two hundred years. Then, as Buddhism declined around 800 CE, there being an influx of Jain worshippers overlapping for a hundred years with the Hindus. Finally, as the Hindus leave the site, the Jains staying there alone for another hundred years. As I approached the 12 Buddhist caves, I felt that I, TOO, could live there for hundreds of years. So, finally in the middle of this complex of Buddhist Caves I approached the greatly anticipated, Cave 6 – home to the statue of the Buddhist Saraswati whom I so wanted to meet. The Sacred Destinations website explains further the significance of Cave 6. It says that it was carved in the 600’s and then elaborates to say: “Cave 6 is home to two of the finest sculptures at Ellora. On the left is the goddess Tara, with an intense but kind expression. Opposite her on the right is Mahamayuri, the Buddhist goddess of learning, shown with her attribute, the peacock. A diligent student sits at his desk below. Significantly, Mahamayuri has a very similar Hindu counterpart, Saraswati”. What a great example of the aforementioned sharing of ideas and spiritual influence! 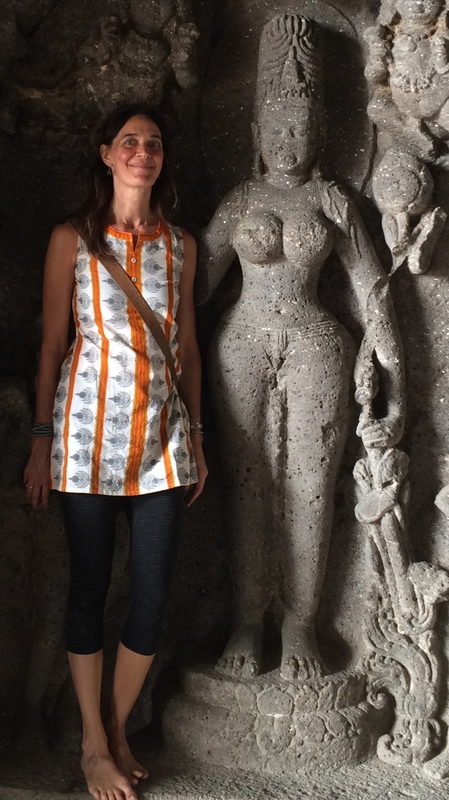 And so, towards the end of my day at the Ellora, after already visiting 28 other caves, I finally happened upon Tara, the female goddess of compassion and representation of the divine feminine. In Wikipedia, it says, “Tārā embodies certain ideals which make her attractive to women practitioners, and her emergence as a Bodhisattva can be seen as a part of Mahayana Buddhism’s reaching out to women, and becoming more inclusive even in 6th-century CE India”. Even though I have long been devoted to Tara and performed practices associated with her, I had not completely appreciated this dramatic shift towards revering female deities. It then dawned on me what a striking contrast this was with the caves at Ajanta. In the Ajanta caves most of the woman depicted are queens, princesses, ladies of court and their maids, dancers, and gorgeous renditions of the temptresses sent by Mara to Buddha on the night of his awakening. There are no images of Tara or other goddesses. 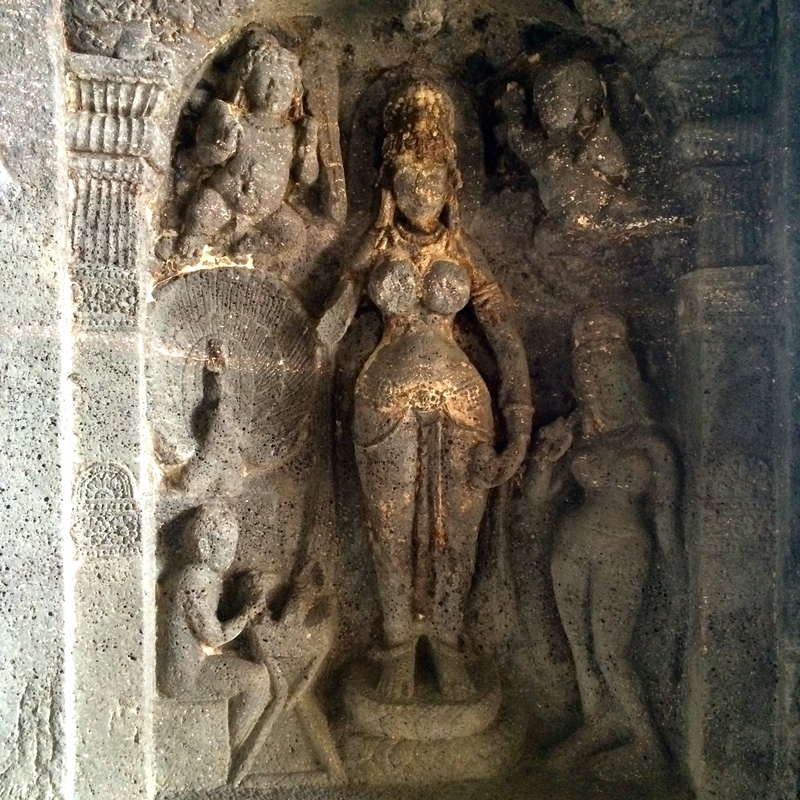 To prove this point, I read – “the earliest, solidly identifiable image of Tārā is most likely that which is still found today at Cave 6 within the rock-cut Buddhist monastic complex of the Ellora Caves in Maharashtra (c. 7th century CE), with her worship being well established by the onset of the Pala Empire in Northeast India (8th century CE)”. WOW. The earliest!!! Just this would easily be enough on such an incredible day. Yet, just opposite Tara, finally I meet the goddess of my quest- the Buddhist goddess of learning, Mahamayuri. She is depicted in a very different way from her Hindu counterpart, and I still know little about her. What I do know, is that if you look closely below, you will see sitting at a desk, the pupil. For me that is the most significant symbol – the student ever learning, humbly sitting at the feet of our possibility to evolve, to pursue our innate creativity, to express our innermost emotional landscape through sound. In my last post, I mentioned my father and his influence through years of archeological digs, and instilling in me a feeling of a solid foundation, to sit in silence and to feel and know my home in the rock of the world. Surrounded by this female energy made me think of my mother. Her influence, rather than being solid, is instead what is most ethereal- the influence of sound and vibration, of female energy bursting forth in the form of her continuous giving, years of nursing, and of her profound musicality. No doubt it is because of her playing the piano and flute, and singing all the harmonies to hymns at church that I fell in love with music early in my life. Well, I feel so blessed, inspired, and now at home surrounding myself with glorious music and the amazing potential we have as human beings to learn. Whether divine or temporal, awakened or every day, may the grace of Tara, Mahamayuri, Saraswati and my mother’s gift continue to be an ever present force in my life…. let me share a few interesting facts with you, probably you are already aware of these facts.. but let me share anyway.. The kailasa temple of the first photo is quite unique, in a way that, it was crafted beginning from the top! it was huge rock.. and the sculpting started at the top of this rock, and then the work proceed directly downwards..! !